All alfresco concerts engage with nature in one way or another. 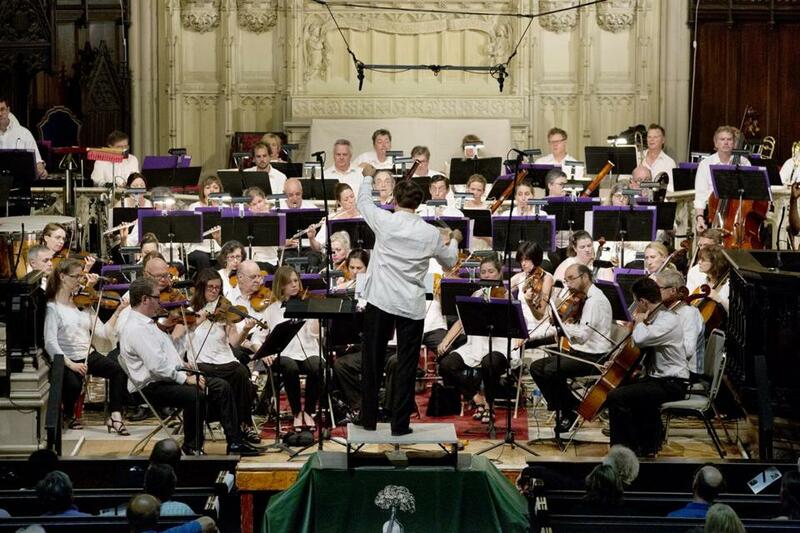 Wednesday’s performance by the Boston Landmarks Orchestra went one step further, choosing nature as its theme under the title “Rhapsody in Green.” Ultimately, the night also deferred to nature, after the threat of rain scuttled plans for the Esplanade and sent audiences and musicians filing into Emmanuel Church. “We’re exchanging river water for holy water,” conductor Christopher Wilkins told the crowd. What the indoor venue lacked in ventilation and twilight views, it made up for in acoustic integrity, as listeners could enjoy this orchestra without the roar of traffic or the blare of those sirens that so often seem to lie in wait for the unsuspecting English horn solo. The night also had going for it Wilkins’s own deft programming hand, which should not be taken for granted. Often big civic-minded concert series set themselves a low bar for artistic creativity, implicitly justifying an overreliance on warhorses in the name of reaching the greatest numbers through music that is already familiar to them. Wilkins, refreshingly, doesn’t seem to buy that calculus and declines to condescend to his audience. Wednesday’s program opened with the premiere of an attractive newly commissioned setting of “At the River” by Berklee professor Francine Trester — elegantly sung by soprano Jayne West — and also included the New England premiere of “River’s Rush,” a stormy and capacious work by composer Kevin Puts, written for the St. Louis Symphony in 2004. The inclusion of those two scores alone would have been enough to make this distinctive as a free nature-themed summer concert, but Wilkins had another spot-on rarity up his sleeve: “And God Created Great Whales” by the prolific Somerville-born composer Alan Hovhaness (1911-2000). The work features actual taped whale songs in a setting of atmospheric orchestral textures, though for this occasion, the Landmarks Orchestra recruited a new cetacean soloist, swapping out Hovhaness’s original tapes for recordings by Salvatore Cerchio, a local biologist who in 1990 captured a particularly virtuosic humpback (“the Pavarotti of whales,” Cerchio told Wednesday’s crowd) crooning off the coast of Kauai. Cerchio’s singer did in fact live up to billing, with a multi-octave range that included high keening clarinet-like squeals and gurgling bass tones with amazing resonance. Sometimes field recordings inserted directly into concert works can all too easily flirt with kitsch (see: Respighi, Ottorino) but the otherworldly strangeness and beauty of this particular whale song pushed such thoughts out of one’s head and encouraged an almost childlike sense of wonderment at this music from beneath the waves. The sea has of course long been heard in the more traditional language of Romantic and Impressionist composers. Mendelssohn’s concert overture “The Hebrides” and Debussy’s “La Mer,” in spirited readings whose vivid contours made up for occasional imprecisions, rounded out the program. This essential free series continues on Wednesdays at 7 p.m. through Aug. 26.